Our guest blogger Dr James Moher (former CWU & T&GWU official) continues with part two of his three part article on Walter Citrine in Russia. 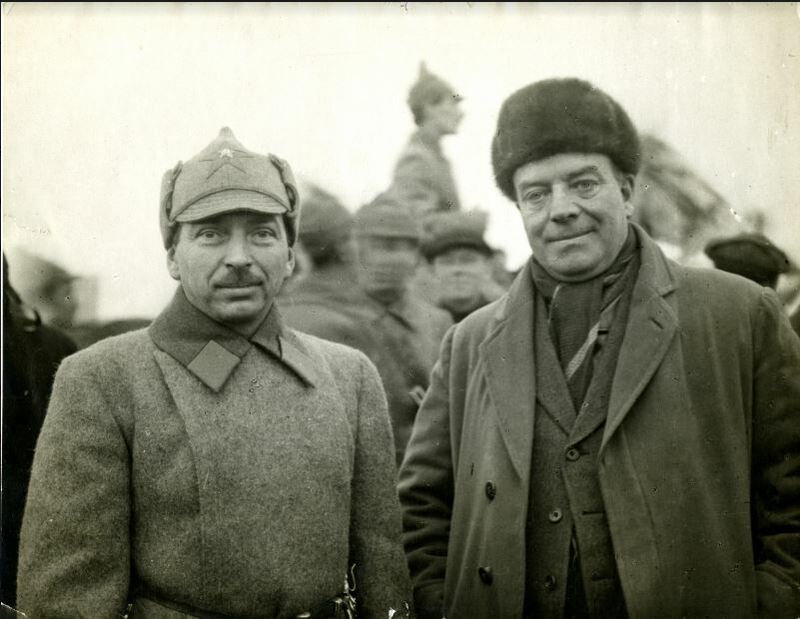 Walter Citrine and George Hicks were particularly interested to probe their Russian hosts about the role of the unions in the Soviet state. This was a key issue in the IFTU ‘merger’ talks, especially for their European union colleagues, who suspected that Tomsky and his colleagues, were primarily communist politicos aiming to undermine the western social democratic union leaderships for communist revolutionary purposes. In the course of the visit, they had a number of serious discussions about how independent the Russian unions really were. There was no doubt but all the leading Russian union officials were all communists, it was a matter of pride for them how much they had played a part in bringing about the October Revolution and in the Civil War. But they did convince Citrine that they were also genuine union leaders. Tomsky was an engraver/compositor by trade and a union activist in the Petrograd and Estonia areas. He had also become a revolutionary as unions were illegal under the Tsarist regime and by the February 1917 revolution, he was an active Bolshevik and had spent spells in prison and exile. In their discussions, he gave them the Party line – that the unions need not be independent as they were all communists and supported the wider economic and social aims of the socialist state over all sectional claims. Citrine, more sceptical than Hicks, argued from their experience with the 1924 Labour government, that unions should always retain their independence. There had been considerable controversy in the Russian Communist Party from 1920 on the role of the unions in the new socialist society. One faction, known as The Workers Opposition, had wanted to give the unions power over managers in the production process and generally run the economy on syndicalist lines. At the other extreme, Trotsky and Bukharin wanted to ‘statify’ them i.e., to incorporate them in the state as organs of its productionist aims. After much bitter wrangling in the Communist Party, a compromise devised by Lenin was agreed. The unions accepted the primacy of managerial control and piece-working, but they were to remain ‘independent of government machinery and control’. In this capacity they would be able to press their members’ claims on pay and conditions, especially in what was still a substantial private sector during that period of state capitalism. In fact, Tomsky had defended the unions vigorously at the expense of his own position and he was removed as chair and sent far away for a while. However, by 1925 he was back in position (said to be with the rising Stalin’s support). Unions then had both considerable autonomy and influence in state economic bodies as wages and productivity improved. However, in 1928, he was again removed by the Communist Party’s powerful fraction in the unions’ Central Council. It is thought that he opposed the dilution of the unions’ independent role in the further development of the economy with the State Five Year Plan for rapid industrialisation. It is ironic that he took this stance, a few years after he had argued the opposite with Citrine and Hicks. As they got to know Tomsky in the course of 1924/5, western union officials, both at IFTU and the TUC, speculated as to his real purpose in seeking to link up the Russian unions with IFTU. He came across as a genuine union official and easy to get along with, rather than a Party ideologue. Accordingly, some thought that he was really trying to strengthen the Russian unions’ independence from State control in the USSR. As Citrine sought to persuade Tomsky of this when he was in Russia, he probably had hopes for this outcome through their Anglo-Russian Joint Advisory Committee (ARJAC) which was set up by the Scarborough Conference of September 1925. As we will see in the third part, the Soviet authorities had very different objectives for ARJAC. When Citrine visited again in 1935, he insisted on meeting Tomsky (who was then in charge of the Soviet Publishing House). To learn that the Russian leader had committed suicide a year later to avoid arrest must have been very distressing for him and can only have strengthened his concerns about how the Soviet Union was going.